A gingerbread house is a lovely way to decorate for the holiday season. You can bake the house from scratch, assemble, and decorate it to make it truly yours. This project is broken down into the steps you need to take. Candy decorations. Unwrap all candy (except foil-wrapped) and place each type in a separate bowl. You don't want to be stuck unwrapping a candy cane while the royal icing begins to harden. Use an oatmeal box or something tall to set the house on while decorating. You have to stand to assemble a gingerbread house, but when decorating a gingerbread house, sit down with the house at eye level. Roll the gingerbread dough directly onto the parchment paper to a thickness of 1/4 inch. 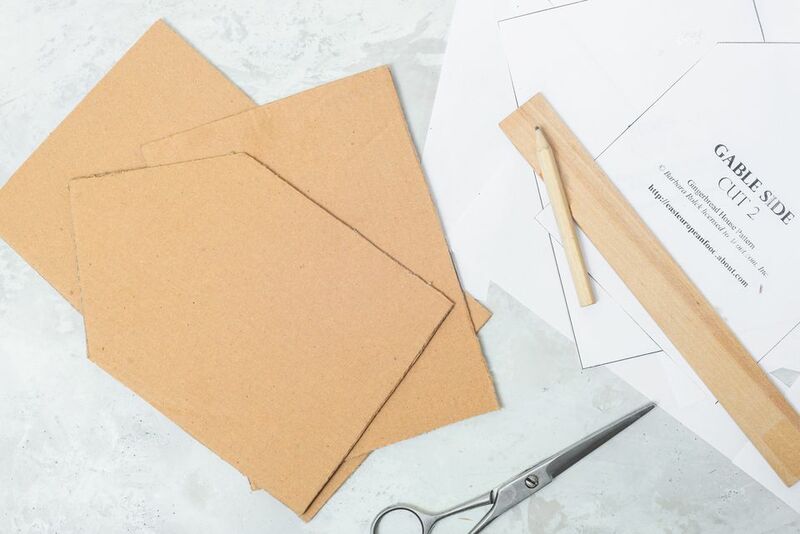 Try to cover the entire sheet of parchment paper with rolled-out dough so you'll be able to cut the maximum number of pieces. Carefully remove the gingerbread dough scraps and cover them with plastic wrap until ready to reroll for the rest of the pieces. It's a good idea to use rimless baking pans or those with just one edge which aids in placing in and removing from the oven. Take the parchment paper full of gingerbread house pieces, which you are grasping by opposite corners, and place it on the pan. Remove the baking pans to a wire rack and don't disturb the gingerbread houses pieces. Let them cool completely before removing. It's a good idea to let baked gingerbread house pieces "cure" or temper for a day to make sure they are hard enough to stand assembly. If they become too soggy because of high humidity or cooking steam, recrisp them for a few minutes in the oven and let them cool before assembling. Now, it's time to assemble and decorate the gingerbread house. Retrieve the cardboard cake circle, pastry bag with #10 and #2 tips, the prepared royal icing, and the baked gingerbread house pieces. Follow these step-by-step instructions for filling a pastry bag. Keep the pastry bag tip covered with a damp (but not wringing wet) paper towel at all times when not in use, otherwise the icing will harden like cement. Using the #10 tip on the pastry bag, lay down a thick L-shaped bead of royal icing on the platform you're building on. Keep your fingers clean and free of icing at all times, otherwise your house will have unsightly smears all over it. Keep your fingers clean and free of icing at all times otherwise your house will have unsightly smears all over it. The edges of both sides of the pieces of gingerbread should have a strip of icing. That way the icing touches the icing instead of the bare gingerbread. This creates a stronger seal. If the project you're working on isn't an intricate pattern, dependent on exactly matching pieces, don't worry if there are gaps between pieces. Just fill them with royal icing. The decorations will cover a multitude of sins. Wait until these two sides are completely dry before moving onto the next walls! This time, lay down only one bead of royal icing on your building platform opposite the long gingerbread house side. Place the gingerbread house gable side in the royal icing and run a bead of royal icing up this second seam. Hold for a few seconds and release. Repeat with the fourth wall. It will be a tight squeeze running a bead of royal icing up this fourth seam, but you can do it! Wait until these two sides are dry before moving onto the roof. Run a bead of royal icing on all edges the roof will touch. First, place one roof side on the gingerbread house, making sure it lines up with the gable peak. Hold a few minutes. Then, while still holding the first roof side, add the second roof side and hold a few minutes. 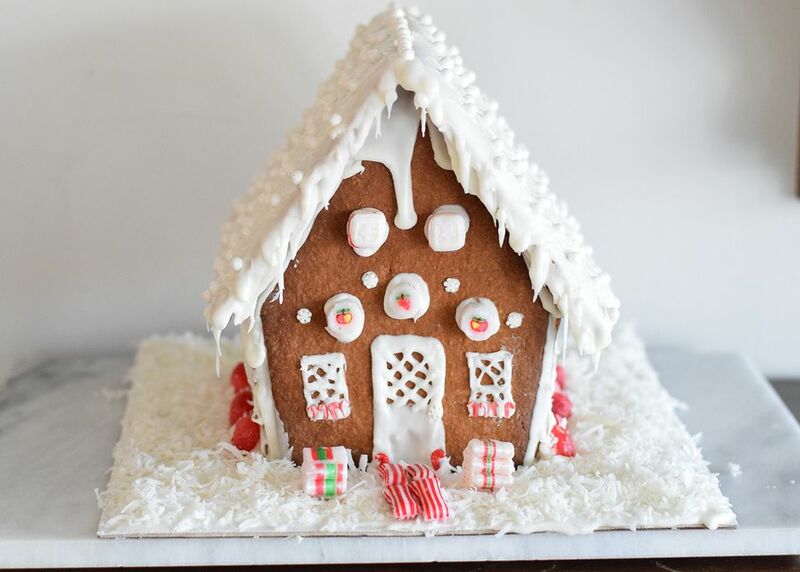 While still holding both roof sides, run a thick bead of royal icing down the seam where the roofs meet at the top. Hold a few minutes more and release. If your royal icing was made correctly, it should adhere with no problem. It's not a bad idea to let the royal icing "mortar" on the assembled gingerbread houses harden for an hour or so before you begin decorating. Cover the base of the gingerbread house with the leftover royal icing and then coat with shredded coconut to cover up any of the mess you left on the board. It also looks like beautiful snow. You can also pipe icicles onto the edges of the roof using a piping bag.